Beauty Dilemma: Can A Dupe Ever Be As Good As The Original? The blogging world is full of money saving recommendations, affordable dupes and indirect copies of some of our most loved premium makeup products. The best thing about being so close to the action and having so many wonderful things land on my desk is that I can easily spot a dupe, an affordable alternative or products that provide the same benefit for a fraction of the cost; there’s something somewhat satisfying about telling the world they can grab an on-trend shade or product that offers an almost indistinguishable difference for a lot less cash. However, in a world that’s currently obsessed with budget buys and more affordable alternatives, can a dupe ever be good as the original? Is it worth splurging on something that can be treasured, or does spending wisely mean our makeup bags will thank us in the long-term? Frustratingly, a lot of what we pay for when we make an indulgent beauty purchase is actually the extravagant packaging; often what’s inside accounts for only a fraction of the cost associated with it, thanks to clever marketing and a lot of attention to detail. It’s well known that glass bottles, metal casings and bespoke branded cases cost a small fortune to produce, so if this is removed is it really possible to create a copy product for a much smaller price? When we compare a lot of the formulas, ingredients and ‘actives’ that make up some of our much loved skincare and beauty products, it doesn’t seem impossible to do so. Particularly within the makeup market, it’s quite easy to create a product that’s ‘inspired’ by premium brands or best selling items. If you’ve ever wondered how Makeup Revolution can create an Urban Decay alternative for an eighth of the price, it’s because they opt for the most basic black generic packaging to ensure all their cost of goods is injected into the products themselves. If you remove the need for fancy embossed packaging and an expensive marketing campaign, then you can cut the retail price and make your customers incredibly happy. All of their money is spent developing the product that we use, rather than pretty packaging that houses it – which is why practically everything on offer is less than a fiver. Other brands that offer fab affordable alternatives and some great ‘dupes’ include Collection, Rimmel and Kiko; they focus on price point, while providing the best quality they can within their restrictions. The result is makeup that’s fun, functional and won’t break the bank. However, what you do often get with investing in a premium brand is a high quality formula that provides a comfortable long-lasting finish. You simply can’t compare a YSL or Chanel lipstick with something you pick up in Superdrug, nor can you ever pick up something quite as good as an Urban Decay eyeshadow – although it’s possible to come close. Sometimes that slightly indulgent purchase is much more than just another makeup buy; it can help us feel good, lift our mood and offer some retail therapy when it’s needed most. Investing your money wisely will ensure you have a portfolio of products you treasure, that work and you can rely on; there’s nothing worse than being let down by a dodgy mascara or spending an hour attempting to blend that budget eyeshadow. The comparison between ‘dupe’ and ‘original’ also depends on the category of product and intended use; I’m a firm believer that brow tools, mascaras and powdered products (face powder, eyeshadow, highlighter etc) can perform without costing the earth, but often lipsticks and foundations are worth spending that little bit more on. Great ‘dupes’ are often based on products ‘of the moment’ that we love for one season but will happily push aside by the next, meaning it’s sometimes worth being thrifty and spending wisely. With so much ‘newness’ hitting the shelves every single month, it’s hard to stay ahead of the trends and ensure our makeup bags are continually updated – dupes provide a way in which we can dip our toes in the pool without having to part with huge piles of cash just to temporarily feel like Cara Delivigne. So, can dupes ever be as good as the original? In my opinion, yes. If you remove the fancy packaging and focus on the product inside (and how it looks/feels on your face,) then sometimes dupes are just as good (sometimes more so) as the original. However, some products can never be copied as effectively as their budget foes would like; sometimes it’s best to stick with the original and treasure it as much as possible, knowing you can rely on it to help you look and feel great. There’s nothing quite like removing a Chanel red lipstick from your bag and temporarily feeling like a glamour goddess; you simply don’t get the same effect with a MaxFactor bullet of red. 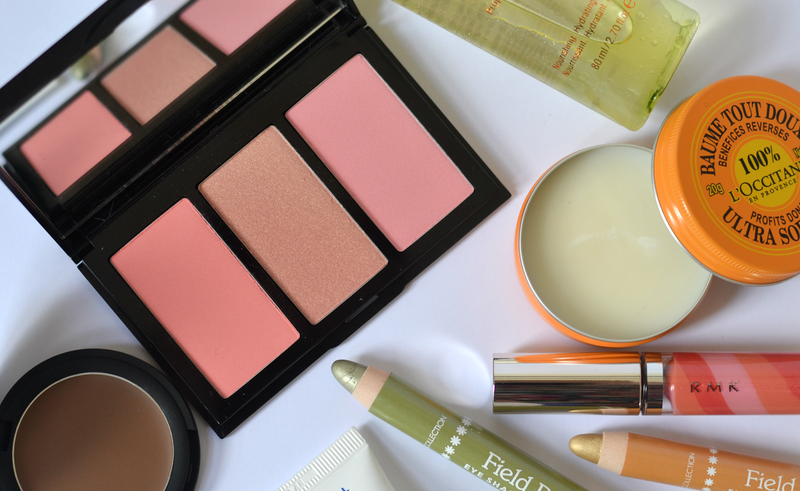 Are you a big fan of dupes, or do you prefer to stick with a few staple products that you invest in wisely? There are some very interesting metallic pencils peeking in around the edge of that photo. Could you tell me what they are? Stay tuned for a post and competition next week! I love a good dupe as long as I don't have to sacrifice on quality. If it's just the packaging then it's well worth losing out on that for a better price. I agree I rarely find a foundation dupe that I love and hence stick to my nars and Laura mercier faves. Eye shadows however are a different matter. I find the results I get from my makeup revolution iconic palettes are so close to those I get with my naked palettes, my purse trembles a little at what I've spent on them over the years. They are so pretty though I forgive them and you're right there is special about using a premium product!! I've found that not even Estee Lauder eyeshadow compare to Urban Decay, so tbh I don't think you can get much better, or even really on par! It'll only ever be a shade dupe, not a quality dupe. To be honest I love a good dupe, but often there is a point where you realise that nothing beats the original. BUT since most high end products are so expensive I can't even spend that much money just on beauty stuff. Therefore I am more than happy that there is still kind of a cheap oportunity for a small budget. I'd love a post about the dupes that are a good match! I don't mind some dupes – lipsticks mainly as I buy so many but for eyeshadow I stick with my UD. Mascaras too, I buy new ones all the time and find it doesn't really matter too much if they are cheap and cheerful. The makeup revolution lipstick dupes for Mac are exact for colour but are nowhere as long lasting. I think a few of the eyeshadows are just as good tho.